A Dutch stamp dealer who was arrested in North Korea this summer has told how he was held in solitary confinement for two weeks and threatened with spending 15 years in prison for spying. Willem Van der Bijl said in a telephone interview that he had visited North Korea about 24 times since 1998 in order to buy stamps, postal stationery and propaganda posters, and that three of his business contacts were arrested with him last August. Although he was freed after a highly unpleasant two weeks during which he was held in a two-by-three metre cell, he has no idea what has happened to his North Korean colleagues, but fears they will be severely punished. He said he had been “intimidated” by his interrogators but not physically mistreated during his detention. “They yelled at me but did not hit me”, he said, adding that he was accused of being a spy apparently because of the large number of photographs he had taken of the North Korean countryside during trips to factories outside Pyongyang to discuss possible joint ventures. He was released after signing a confession to his alleged crimes, and said the North Koreans confiscated his laptop and camera as well as a Kim Il Sung badge that had been given to him, but his money was returned to him. “I was happy to leave,” he said, adding that “There was nothing really wrong in what I did…All I did in North Korea was fairly correct”. Although mainly a stamp dealer with a stamp shop in Utrecht, he said he had become interested in collecting propaganda posters during his last few visits, and had a collection of thousands of posters. He said North Korean officials seemed divided in their attitude as to whether such posters should be sold to foreigners. “The ‘doves’ say this art is popular in the west and should be sold; the ‘hawks’ do not want to export secret paintings, they are meant for the Korean people,” Van der Bijl said. He said his hopes mounted every Tuesday and Saturday that he would be released as there are flights from Pyongyang to Beijing on those days, and as time progressed he became more worried that he would be sentenced to spending up to 15 years in jail for espionage. When he was freed he was told he could apply for a visa to visit North Korea again, but he told NKEW said he had no wish to do so as long as the current regime remains in power. He said he had taken car journeys about 120 km outside Pyongyang nominally to visit companies to discuss joint ventures, but he was more interested in taking photographs of the impoverished countryside, and that North Korean factories were too dilapidated for there to be any serious chance of doing business with them. Somewhat surprisingly, Van der Bijl is quoted on two official North Korean websites here and here before his arrest concerning local elections in North Korea in July. He visited a polling station during the elections and was quoted as saying, “Looking round the poll, I have been greatly impressed by the free and democratic elections and I have had a better understanding of the DPRK’s reality. Also surprisingly, Van der Bijl is shown wearing a Kim badge in two photographs of him on the Pyongyang Times websites. It’s rare for foreigners to be given a Kim badge and still rarer for them to be shown wearing one in the official North Korean media. Van der Bijl said he was unsure where the photos were taken. One of the websites shows Van der Bijl’s signature, copied from his passport. 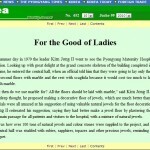 One summer day in 1979 the leader Kim Jong Il went to see the Pyongyang Maternity Hospital under construction. Looking up with great delight at the grand concrete skeleton of the building completed in a short span of time, he entered the central hall, when an official told him that they were going to lay only the ground, first and second floors with marble and the rest with scagliola because it would cost too much to lay all the floors with marble. “What then do we use marble for? 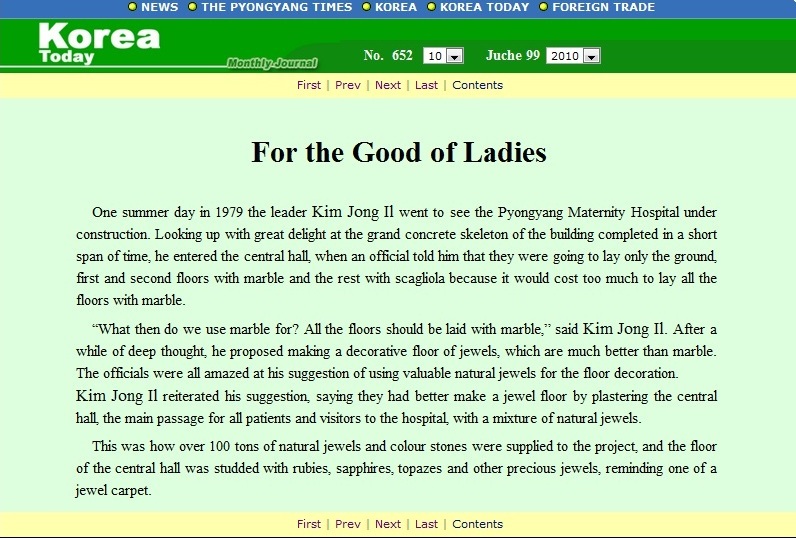 All the floors should be laid with marble,” said Kim Jong Il. 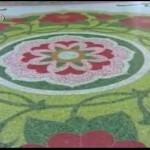 After a while of deep thought, he proposed making a decorative floor of jewels, which are much better than marble. The officials were all amazed at his suggestion of using valuable natural jewels for the floor decoration. 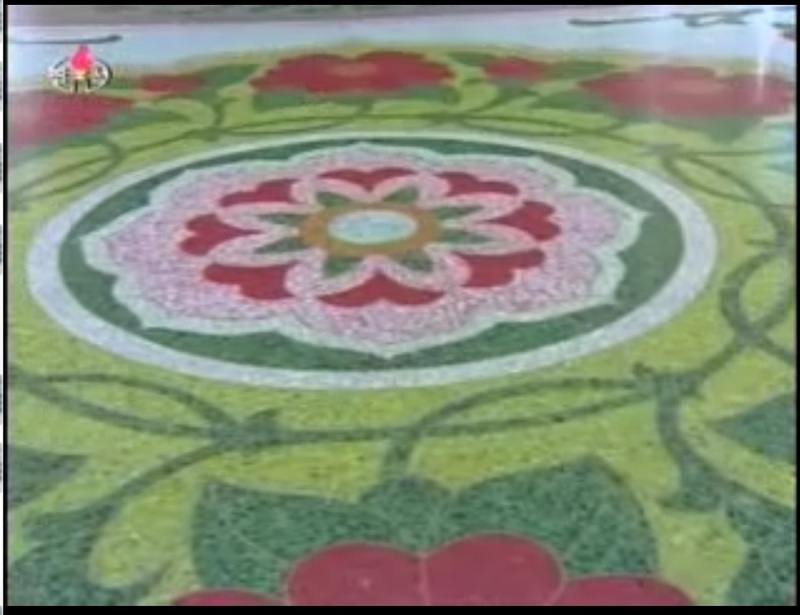 Kim Jong Il reiterated his suggestion, saying they had better make a jewel floor by plastering the central hall, the main passage for all patients and visitors to the hospital, with a mixture of natural jewels. This was how over 100 tons of natural jewels and colour stones were supplied to the project, and the floor of the central hall was studded with rubies, sapphires, topazes and other precious jewels, reminding one of a jewel carpet. I have no idea how to build a hospital, but I am fairly confident that this was a poor suggestion. 3. The third item is a new web page featuring selected pictures of Kim Jong–il’s guidance tours. Check out “Kim Jong–il looking at things“. 4. The Fourth item is a discussion that is part art and part propaganda. Is this Kim Jong–un or not? 38 North and Leonid Petrov offer some information. UPDATE: it is not. 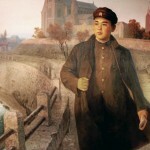 The painting is of Kim Il-sung in Manchuria. Today our service personnel and people greet the New Year Juche 99 (2010) with the pride of being victors, who wrote a new history of great revolutionary upsurge. A heyday unprecedented in the history of the nation lies ahead of them, who are courageously rushing towards the world by tapping the inexhaustible potentials of Songun Korea. Kim Jong Il is leading the campaign for the building of a great, prosperous and powerful nation to a brilliant victory as he steers the efforts to effect a great revolutionary upsurge on the strength of single-hearted unity. Now all the service personnel of the Korean People’s Army and all the people are offering their heartfelt thanks and the greatest glory to him who is shaping the brilliant future of the country and the revolution with unflagging energy and untiring leadership, and are filled with a firm determination to support the Party’s cause to the last with intense loyalty and heroic feats. Last year Juche 98 (2009) was a year of dramatic change, when a phenomenal age of realizing all the ideals of the people has come. Kim Jong Il worked out a grand plan for making a decisive turn in the Korean revolution and the building of a thriving nation by effecting a new revolutionary upsurge and wisely led the efforts of the service personnel and people. 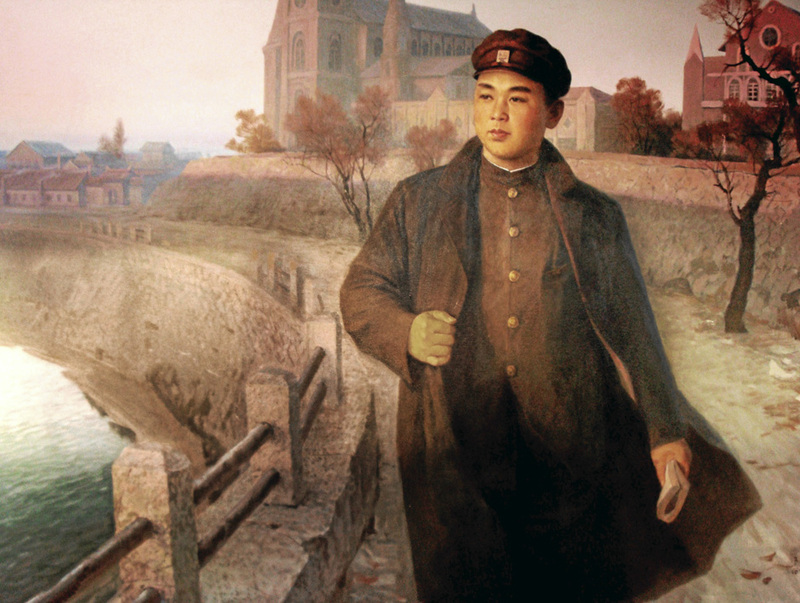 After kindling the torch of a great upsurge in Kangson, home to the Chollima movement, he proposed launching the 150-day and 100-day campaigns successively, and took revolutionary measures to bring them to a victorious conclusion. His outstanding leadership ability was the source of impetus for the unprecedentedly great innovations and leap. The matchless fighting spirit of the leader, who continued the forced march of high intensity to vibrant hard-fought fields for an upsurge throughout the year, burning his heart with noble love of his country and fellow people, gave free rein to the mental strength of all the service personnel and people and worked world-startling miracles across the country. Last year’s struggle etched in their hearts the truth that his decision is precisely practice and they will always emerge victorious when they follow him. Last year witnessed one remarkable event of knocking on the gate to a thriving nation after another. The successful launch of man-made satellite Kwangmyongsong No. 2 and the successful second underground nuclear test by our own efforts and technology were a landmark event signalling the first victory in the building of a prosperous nation. The perfection of the Juche-based steel-making system in the Songjin Steel Complex and the attainment of the cutting edge of the CNC technology constitute a great victory of the great Juche idea and an auspicious event for the whole country and all the people that demonstrated our inexhaustible economic and technological potentials. The firework displays on the Day of the Sun–birthday of President Kim Il Sung–, May Day and the WPK anniversary in October were a striking manifestation of the lofty ideals and ambition of the Korean people who are building a thriving nation and the rosy future of Songun Korea that is advancing under the leadership of the great Party. The economy of the country entered the stage of full-scale upturn as all the people staged a life-and-death struggle under the leadership of the Party. The 150-day and 100-day campaigns were an unforgettable struggle that wrote the most brilliant chapter in the history of our great upsurge. The whole course of the heroic campaigns conducted by all the people, including the workers, clearly showed what kinds of miracles would be performed and what kinds of changes would be effected when we give free rein to the might of the harmonious whole of our leader, our Party and our people, in which the Party trusts the people and the people defends the Party and the leader at the risk of their lives. Production sharply increased in the sectors of basic industries, vanguards of the national economy, and the industry as a whole achieved revitalization. Structures of lasting value in the Songun era, like the Nyongwon Power Station, Wonsan Youth Power Station, Waterway on the Miru Plain and Mansudae Street, were built across the country. The gasification project in the Namhung Youth Chemical Complex was completed, and dynamic efforts were made to upgrade the major factories and other enterprises. Last year remarkable achievements were brought about in agricultural production and rural construction, many cooperative farms transformed into ideal villages appropriate to a prosperous country and the production foundations and potentials of the light-industry sectors, including the textile and food-processing industries, strengthened markedly. Remarkable successes were achieved in the development of socialist culture. In the heat of the revolution in literature and the arts in the Songun era conducted under the energetic guidance of Kim Jong Il, masterpieces were produced and re-presented one after another in the fields of the cinema, opera, drama and music. Examples of mass-based culture and the arts in the era of a great upsurge were set to inspire the whole country with revolutionary enthusiasm and militant spirit. Kim Il Sung University, Wonsan University of Agriculture and other institutions of learning were refurnished splendidly, and sportspersons registered good results bringing great pleasure to the people. The victorious great upsurge of last year confirms that the DPRK is developing in leaps and bounds, and the day when the successful building of a thriving nation will be proclaimed is just approaching. New Year Juche 99 (2010) is a year of general offensive, when all-Party and nationwide efforts should be concentrated on improving the people’s standard of living on the basis of the laudable victory and achievements of the great revolutionary upsurge. This year marks the 65th anniversaries of the founding of the glorious Workers’ Party of Korea and the country’s liberation. The anniversary of the founding of the WPK will be an important occasion for demonstrating the mounting national spirit and mettle of the Korean army and people, who are adding brilliance to the undying exploits performed by President Kim Il Sung in building the Party and carrying out the revolutionary cause of Juche and the human cause of independence, and are speeding up the building of a thriving socialist nation on the strength of the single-hearted unity around the leadership of the revolution. We should celebrate the anniversary as a great revolutionary event to be written down in the history of Kim Il Sung’s nation as we give the fullest play to their ardent loyalty to the Party, great guide, that has opened up a bright future for the country and people. The great upsurge we are bringing about as we make unheard-of creation and leap forward under the leadership of the Party has entered a new phase. The might of the country’s economy, including the heavy industry, was strengthened in the flames of the gigantic great upsurge, setting up a springboard for the country, already a politico-ideological and military power, to justifiably reach the status of an economic giant. Now, based on the brilliant achievements of the great revolutionary upsurge, the Party is unfolding unprecedentedly grand plans and operations to bring about a decisive turn in the people’s standard of living. It is the firm determination and will of the Party to enable the people, who have braved severe hardships together with the Party, to enjoy the blessing of socialism to their heart’s content by getting them relish the substantial fruits of the present great upsurge and realize without fail the noble intention and desire of President Kim Il Sung who devoted his heart and soul to the people all his life. True to the intention of the Party, which regards it as the supreme principle in its activities to steadily improve the people’s standard of living and spares nothing for them, we should channel all our efforts to improving the people’s standard of living. To launch a sweeping campaign to bring about a drastic turn in the improving of the people’s standard of living in the flames of the great revolutionary upsurge—this is the general orientation of this year’s efforts. We should conduct an all-Party and nationwide drive for improving the people’s standard of living to ensure that the achievements of the great upsurge are followed by greater ones and this year becomes a prosperous year filled with the people’s happiness. “Bring about a radical turn in the people’s standard of living by accelerating the development of light industry and agriculture once again this year that marks the 65th anniversary of the founding of the Workers’ Party of Korea!” is a slogan we should uphold. Light industry and agriculture are the major fronts in the efforts for the improving of the people’s standard of living. Great are the foundations of light industry and agriculture, which our Party has laid out with an eye on today against all odds. An all-Party, nationwide effort should be directed to mass-producing consumer goods. The light-industry sector should carry forward the upgrading of its factories and enterprises on a high level, and strive to improve the quality of the consumer goods. Local-industry factories should be operated at full capacity, and units, as many as possible, should launch a campaign to turn out more daily necessities favoured by the public. The agricultural sector should sharply increase the grain output by thoroughly applying the Party’s policy of agricultural revolution, like improving the seeds, doing double cropping and improving potato and soya bean farming. It should strictly observe the requirements of the Juche farming method and introduce organic and other new farming methods and technologies. We should ensure that the updated stockbreeding, fish farming and fruit production bases that have established a Juche-oriented breeding system and embodied the principle of profitability demonstrate their great effect in reality. We should radically increase the state investment in the fields related to the people’s living, and all the sectors and units should supply fully and in time the raw and other materials needed for the production of light-industry goods. We should gain access to more foreign markets, and undertake foreign trade in a brisk way to contribute to economic construction and the improving of the people’s standard of living. The four vanguard sectors are the engine of the national economy and a key to solving the problem of the people’s living. In December last year, Kim Jong Il kindled the flame for the new year’s drive while inspecting the Kim Chaek Iron and Steel Complex and placed the workers of the Songjin Steel Complex, who had perfected the Juche-based steel-making system, in the van of the great revolutionary upsurge in the Songun era. The vanguard sectors, with a firm view that the development of light industry and agriculture depends on that of heavy industry, should push ahead with today’s general offensive for the improving of the people’s standard of living by means of increased production. Steel production leads to the production of grain and machinery. The sector of metal industry should increase the capacity of Juche iron production that relies on the domestic raw materials and fuel and scale without fail the targets of pig iron, steel and rolled steel production set by the Party. The sector of electric power industry should channel effort to run thermal power stations at full capacity and push ahead with the construction of large-scale hydroelectric power stations, including the Huichon Power Station. The sector of coal industry should produce coal without condition for the thermal power stations, chemical factories and other important units, and step up modernization projects to steadily enhance its production capacities. The sector of rail transport should set an order and discipline as strict as in the army, produce new-type locomotives and freight cars in a larger number and make railway service modernized and railways heavy-duty. The sector of machine-building industry should extend the scope of introduction of the CNC technology on a high standard as required by the IT age, and effect a revolution in the production of tools, so as to produce high-performance, state-of-the-art machinery in a larger number. We should implement the people-oriented policies of the Party and the state to enable all the people to substantially enjoy the benefits of socialism. The true nature of our socialism lies in putting the people’s well-being above anything else and providing them with all the benefits. We should ensure that the advantages of the people-oriented policies, like giving free medical care and free education, formulated by President Kim Il Sung and applied by the Party and state throughout their history are given fuller play to in the people’s living. We should speed up the construction of 100 000 flats in Pyongyang with those in Mansudae Street as a model, and build beautiful socialist streets and villages in a greater number in other urban and rural areas. Socialist principles should be maintained in commodity circulation, and the quality of welfare service improved decisively. The fundamental secret of making a new leap in this year’s general offensive is in launching a campaign to push back the frontiers of science and technology in all sectors. We must turn out as one under the slogan, “Let us push back the frontiers of science and technology in all the sectors of the building of a great, prosperous and powerful country and leap higher and faster!” The sector of defence industry, a major front in pushing back the frontiers of science and technology, should continue to lead the efforts to open the gate to a great, prosperous and powerful country, and all other sectors and units of the national economy should launch a drive to push back the frontiers of science and technology. They should bring science and technology close to production and put themselves on a modern and scientific basis in a far-sighted manner, focusing on enhancing their abilities to develop new technologies and products. We should map out a correct strategy for the development of science and technology as required by the 21st century, and rapidly develop core technologies, technical engineering of major sectors and basic science. Scientists and technicians should fulfil their role as the pioneers in pushing back the frontiers of science and technology and standard-bearers in making their country a scientific and technological giant, with a determination to glorify their country by means of their intelligence, their technology. All the sectors should conduct a vigorous mass technological innovation movement to push back the frontiers of science and technology and create new norms and records. Today’s vibrant reality requires a revolutionary change in the organizing of economic work. The leading economic officials should map out aggressive and realistic business and management strategies, and actively push ahead with the advance of the current great upsurge. A strict discipline should be established in planning, financial management and labour administration, so as to give full play to the superiority of the highly-organized, socialist planned economy. In order to maximize the speed of this year’s general offensive, it is necessary to give steady play to the unconquerable mental strength of the service personnel and people. Our Party remains unchanged in its stand to persistently hold fast to the ideological strength, mental strength, no matter how the situation may change. The mental strength of our people is based on the strong will and fighting spirit of General Kim Jong Il. All the Party members and other people should become staunch revolutionaries and vanguard fighters, who, defending their leader unto death, translate into reality the idea of great upsurge and the far-reaching plans of the General, who continues his unremitting forced march for the benefit of his country and fellow people. The slogan “When the Party is determined, we can do anything!” must become the eternal motto of our people in their life and struggle. For us, who have to make a higher and faster leap towards the world, national dignity is as precious as life itself. We should thoroughly embody the Korean-nation-first spirit in all fields of social life as befits the people of a dignified power, who opened up an era of frontier science in which our satellite is circling the orbit. The sector of art and literature should produce many masterpieces so as to give the fullest play to the mental strength of the service personnel and people. In order to achieve the goals set by the Party this year, we should strengthen in every way the might of our revolutionary ranks, whose core is the Korean People’s Army. The KPA should plan and conduct all forms of its military and political work on the highest level this year that marks the 50th anniversary of the start of the Songun-based revolutionary leadership of Supreme Commander Kim Jong Il, thus giving fuller play to the inexhaustible might of the revolutionary army of Mt. Paektu. The KPA is an elite force that has formed a harmonious whole with the Supreme Commander in idea and will, in disposition and pluck, and in feeling and emotion. Kim Jong Il!” It should ensure that it overflows with the soldiers’ spirit of implementing without condition the orders and directives of the Supreme Commander by holding the work of establishing the revolutionary command system and military discipline as a priority task of the Party political work and developing the work without letup. It should always remain highly alert without a moment of relaxation or indolence while keeping itself fully ready for combat action so that it can resolutely frustrate any surprise attacks of the enemy. The men and officers of the People’s Army should continue to perform feats that would go down in history in the grand construction sites, including the Huichon Power Station, by displaying the revolutionary soldier spirit. Under the slogan “Let us help the people!” they should strengthen the unity between the army and the people, a foundation of Songun Korea, and become the role models for civilians in the ideological spirit, morality, sports and physical culture, the arts and all other aspects. The working class, youth and all other people, who are taking part in the effort for the building of a great, prosperous and powerful country, should launch determined offensives, regarding their work places as battle fields. Our workers should create a new speed of advance in the spirit of having performed labour feats during the 150-day and 100-day campaigns. The youth, who are a shock brigade in the great revolutionary upsurge, should make breakthroughs in the construction site of the Paektusan Songun Youth Power Station and other most difficult and labour-intensive posts and build more monumental edifices representing the Songun era, burning their hearts with the determination to move even the mountain if the Party calls them to do so. They should become heroes, who add lustre to the era of great upsurge with undying labour feats, and talented persons, who highly demonstrate the dignity of the country by pushing back the frontiers of science and technology. We should strengthen the Party and remarkably enhance the role of Party organizations to achieve a brilliant victory in this year’s general offensive. This year, when we will be celebrating the 65th anniversary of the founding of the Party, Party organizations should give free rein to our Party’s militant might, which was built in the tempest of the Songun revolution, by bringing about a fresh turn in the Party work. They should further intensify the Three-Revolution Red Flag Movement, so as to ensure that the revolution in ideology, technology and culture is waged briskly at all units. We should defend the interests of the masses in a thoroughgoing way and solve all problems by relying on their strength as required by the revolutionary mass line of the Party. Officials should become true servants of the people, who understand their sentiments and unfold their work as suited to these sentiments, and commanding personnel who, enjoy reputation and love among them, as they are possessed of free and easy character and ennobling humane traits. All Party members, with a high political consciousness that they are the members of the glorious Workers’ Party of Korea, should become skillful political activists and courageous fighters, who always hold the flag in the van in all fronts of making a great upsurge. The working people’s organizations should strengthen ideological education and briskly conduct various kinds of mass movements, like the socialist emulation movement among their members so as to give free rein to their patriotic enthusiasm in today’s effort for building a great, prosperous and powerful nation. This year marks the 10th anniversary of the publication of the historic June 15 North-South Joint Declaration. The North-South Summit and the publication of the June 15 North-South Joint Declaration in 2000 were a historic event that is of great significance in accomplishing the cause of national reunification. Under the banner of June 15 North-South Joint Declaration, a new era of independent reunification has been opened, and great, unprecedented successes were achieved in the development of inter-Korean relations and the national reunification movement. The previous ten years since the publication of the June 15 Declaration followed by the publication of the October 4 Declaration for its implementation, during which the Korean nation has advanced along the road for independent reunification and peace and prosperity, has clearly confirmed that these declarations are the most reasonable reunification programmes and the ideal of “by our nation itself” is the very national spirit and the one and only ideal in the June 15 reunification era. Last year, we took active and bold measures and made sincere efforts in order to improve the aggravated inter-Korean relations and bring a radical phase in national reunification. Our measures evoked great support and sympathy at home and abroad and created an atmosphere of dialogue and cooperation between the north and the south. The schemes of the separatist forces to thwart the advance of the era of June 15 reunification are vicious, but they cannot break the desire and will of the fellow countrymen to achieve independent reunification and national prosperity by implementing the north-south joint declarations, and it is inevitable that the pro-reunification, patriotic forces will prevail over the separatist forces and emerge victorious. The way for improving the north-south relations should be opened. Unshakable is our stand that we will improve the north-south relations and open the way for national reunification on the basis of the historic June 15 Joint Declaration and October 4 Declaration. If the south Korean authorities continue to negate the June 15 Declaration and cling to the policy of confrontation in collusion with the foreign forces, the relations between north and the south will never be improved. They should refrain from committing acts that may aggravate the confrontation and tension, and take the road of respecting the North-South Joint Declaration, promoting north-south dialogue and improving the relations between both sides. National reconciliation and cooperation should be promoted actively. Reconciliation should be promoted with the common national interests given precedence, and cooperation should be encouraged through travel and contacts between the people from all walks of life. All sorts of legal and institutional mechanisms that hinder the projects for common interests and prosperity of the nation should be abolished and free discussion and activities of the broad sections of the people for reunification should be fully ensured. The unity of the entire nation constitutes a decisive guarantee for the country’s reunification. All the fellow countrymen in the north, south and abroad should strengthen solidarity and collaboration to develop the national reunification movement. They should build up the atmosphere of independent national reunification, reconciliation, cooperation and unity on a nationwide scale to greet the 10th anniversary of the publication of the June 15 North-South Joint Declaration and the 30th anniversary of the advancing of the proposal for the founding of the Democratic Federal Republic of Koryo. The entire Korean nation should crown the year 2010 as a year of opening a new phase of independent reunification by frustrating all challenges of the anti-reunification forces with their concerted efforts and stepping up the grand nationwide march toward reunification. The fundamental task for ensuring peace and stability on the Korean peninsula and in the rest of Asia is to put an end to the hostile relationship between the DPRK and the USA. It is the consistent stand of the DPRK to establish a lasting peace system on the Korean peninsula and make it nuclear-free through dialogue and negotiations. Our Party and the Government of our Republic will strive to develop relations of good-neighbourliness and friendship with other countries and achieve global independence under the unfurled banner of independence, peace and friendship. Our Party is a great guide which steers our motherland and people to sure victory, and ours are a heroic army and people who perform everything without fail once the Party has planned and decided to do it. The majestic firework display to be held on the auspicious October holiday will resound all over the world as a reflection of the determination of all the service personnel and people to follow the Party to the last along the road of Songun and the delight of all the people in enjoying the blessings of socialism. UPDATE 2: NOKO Jeans are on sale here and here. A SWEDISH department store on Saturday cancelled what was to be the sale of the ‘first ever’ brand of jeans made in North Korea, the Swedish company behind the communist-made dark denims said. ‘Apparently PUB has censored our exhibition/store by shutting it down and ‘confiscating’ the jeans because of the ‘working conditions in North Korea’,’ Jakob Ohlsson of company Noko Jeans told AFP in an email. ‘At first i thought it was a joke but everything has been removed from the store,’ he added. Mr Ohlsson, along with Jacob Aastroem and Tor Rauden Kaellstigen – all under the age of 25 and with no previous experience in business or fashion – started Noko Jeans in mid-2007, prompted by a desire to enter in contact with isolationist North Korea. Their designer jeans were to be sold starting on Saturday at Aplace, a boutique that is a tenant of the trendy PUB department store in central Stockholm. ‘A half-hour before opening, we got a call from the head of the department store and he explained to me… that PUB cannot sell the Noko Jeans,’ Kalle Tollmar, the founder and CEO of Aplace told AFP. ‘The explanation I got was that (the store’s management) had taken the decision… that PUB is not the right place, or platform, for this kind of political discussion,’ he said, confirming his store was hoping to continue distribution of the controversial duds at another location. A Stockholm department store says it won’t carry a new line of North Korean-made designer jeans because it doesn’t want ties to the isolated communist nation. The Noko Jeans line is the brainchild of three Swedish entrepreneurs who hoped to help break North Korea’s isolation through increased trade with the West. A spokesman for the retail space where Noko Jeans was selling its product says the jeans were taken off shelves early Saturday. Noko Jeans spokesman Jacob Astrom says he regrets the decision is looking for a new shop location. The jeans will be available online. The NOKO web page says that the jeans will be available on Monday, but in Sweden, Monday has nearly come and gone and the jeans are still not for sale on the web. Designer jeans labeled “Made in North Korea” will go on sale this Friday at a trendy department store in the Swedish capital, marking a first foray into Western fashion for the reclusive communist state. The jeans, marketed under the “Noko” brand, carry a price tag of 1,500 Swedish crowns ($215) and will share shelf space at Stockholm’s PUB store with brands such as Guess and Levi’s. Noko’s founders told Reuters they had spent over a year trying to gain access to factory operators in North Korea, and struggled with poor communications and an unfamiliar approach to doing business once inside the country. “The reason we did this was to come closer to a country that was very difficult to get into contact with,” Astrom said. But the process of agreeing a deal to produce just 1,100 pairs of jeans — the first ever produced by the country, according to the founders — often proved baffling. E-mails vanished into a void and communications were strained. “Everyone is a manager. Even our chauffeur was some sort of manager,” said founder Jakob Ohlsson, adding that North Korean titles were often confusing. After being turned down by North Korea’s largest textile company, the group managed to secure a manufacturing deal with its largest mining company, Trade 4, which also happens to run a small textile operations on its site. During the summer, the trio traveled to the factory in North Korea to oversee the production process and ensure that workers there were treated according to Noko’s guidelines. “We were forced to operate by micro-management,” Ohlsson said, referring to his experience on the factory floor. Fashionable novelty seekers can order Noko jeans from the company’s website www.nokojeans.com after December 4, but you are not likely to see a pair on the streets of Pyongyang, North Korea’s capital, anytime soon. Socialist dress code forbids them. Mr Ohlsson explained black denim was chosen because North Koreans “usually associate blue jeans with America. That’s why it’s a little taboo”. But the high ticket price for the jeans is not simply aimed at finding an exclusive niche in the market. Read previous NOKO Jeans posts here, here, here and here. December 4 this year marks the 60th founding anniversary of The Foreign Language Magazines, DPRK. On the occasion we extend heartfelt gratitude to our readers. We began to publish our journal, titled New Korea, in January 1950, hoping to help the readers understand how the Koreans had lived before they got free from the Japanese colonial rule and engaged in building a sovereign independent state, what they were aspiring after and what course they would take in the future. Later the title changed to Korea Today. The monthly magazine has so far carried policies the Workers’ Party of Korea set forth in each stage of socialist construction, achievements the Korean people made in their implementation, independent and creative life of the working masses and their happiness as well as the history, geography and culture of Korea. Also introduced are the struggle of the Koreans and other progressive people for reunifying the nation that has been divided into the north and the south for over 60 years and building a new independent world—in various styles and methods. Published in Russian alone in the initial years, the monthly is now available in English, Chinese, French, Spanish and Arabic, too. You can get access to Korea Today on the Naenara site. We’ll do our best to help you know the realities of Korea where building of a thriving nation is on its height, the efforts of the Korean people for national reunification and the struggle of Koreans and other progressive people around the world for a new, free and peaceful world. 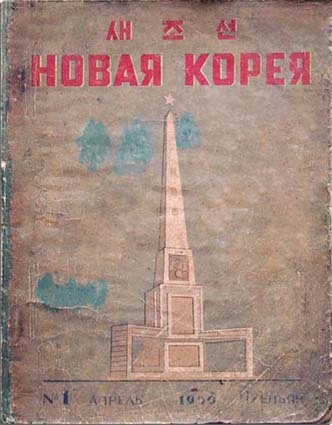 It is interesting that Korea Today would remind everyone that their first publications were in Russian and featured Pyongyang’s Liberation Tower (located here) on the cover. It removes all doubt about who was actually in control at the time (i.e. not Kim Il Sung). (Новая Корея=New Korea). Korea Today is full of all sorts of interesting and useless tid-bits on the DPRK–such as this. Korea Today, Korea, and Kumsukangsan are all published by the Pyongyang Foreign Languages Printing House (also turning 60) located here. The Soviet equivalent of Korea Today, named Soviet Russia Today, published a piece about the early days of the DPRK by American communist Ana Louise Strong, who was one of the first Americans allowed into the country. Learn more here. You are currently browsing the archives for the Korea Today category.